Summary: Two new running packs from Orange Mud for 2018 made for fast and light movement. One has larger storage and fluid carrying capacity than the other, but construction is otherwise very similar, with generously sized front and shoulder pockets, dual sternum strap adjustment, abrasion resistant stretch mesh external fabrics, and an external shock cord to tie down larger items. 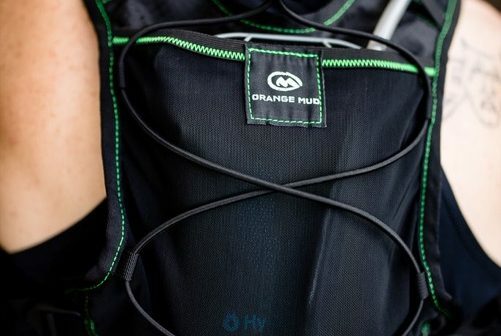 Orange Mud entered the hydration space as a category disruptor, with vests that featured large capacity water bottles carried high on the back rather than using traditional fluid reservoirs. While those models still exist in the Orange Mud lineup, the company has continued its innovative approach to product design. 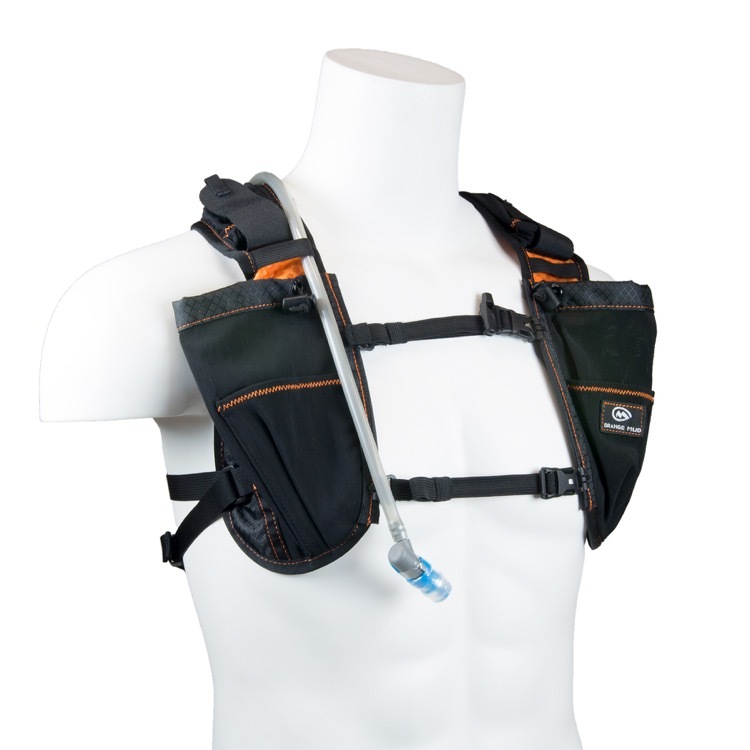 It’s interesting to see that as the rest of the industry has zigged toward bottles and flasks carried on the front of the vest (see the hydration vest review in the April issue of UltraRunning), Orange Mud is zagging toward a design that many of us have always found very appealing: combining rear-mounted fluid reservoirs with generous front storage space that places everything within easy reach. As the names imply, the Endurance Pack 2.0 and Gear Vest 2.0 are both updates to models that debuted last year. They’ve both been tweaked primarily in their sizing and adjustability, which is important as they are both one-size-fits-most models. The design of both vests is identical on the front side, with key differences in the models being how much fluid and cargo can be carried in back. The Gear Vest 2.0 is a minimalist vest designed to carry only the essentials for lightweight movement. 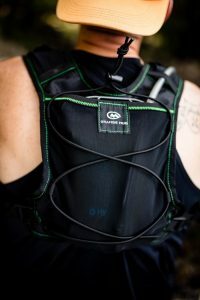 The front chest harness on this year’s Gear Vest is about 1.5″ longer than on last year’s model, and the vest also has a second sternum slider and added front chest pockets. One aspect of both these vests that we love is the spaciousness of the front pockets; they can accommodate flasks or bottles up to 600ml (note that flasks are not included with either of these vests), and are roomy enough to carry large cell phones, energy waffles, headlamps, or gloves with no problem at all. These pockets can be cinched down with a shock cord – which should then be tucked into something unless you want it poking your face sometimes – and there are external trash pouches on both pockets to stash wrappers on the go. Above both front pockets are another Orange Mud innovation: dual shoulder pockets that secure with a front-end Velcro strap. Both of these pockets are thoughtfully made with a sweat-resistant backing, so they are ideal for pills or other moisture-sensitive cargo. In our experience, these pockets are better for soft items, because they sit directly on top of the shoulder and will tend to curl downward. They can also be a bit tricky to access if your shoulder range of motion is limited, or if you are on the stocky side in your upper torso. 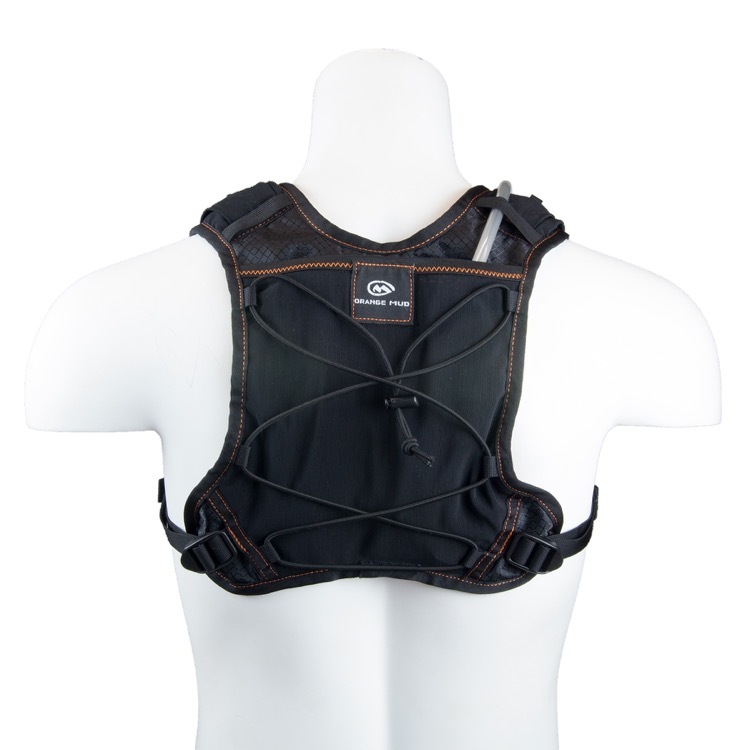 The back side of the Gear Vest 2.0 is limited to the stretch mesh compartment for the 1L reservoir, and an external shock cord to strap down larger items. 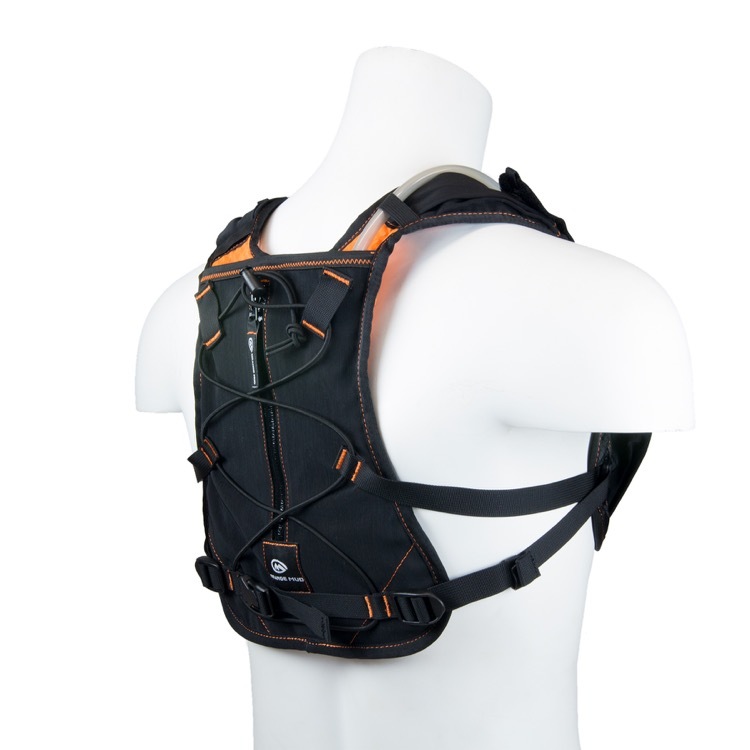 It’s possible to stuff smaller odds and ends on either side of the bladder, but this vest isn’t focused on cargo capacity – so if you’re looking to go longer (or at least farther between aid spots), look to the Endurance Pack 2.0 instead, which has twice the cargo and fluid capacity. 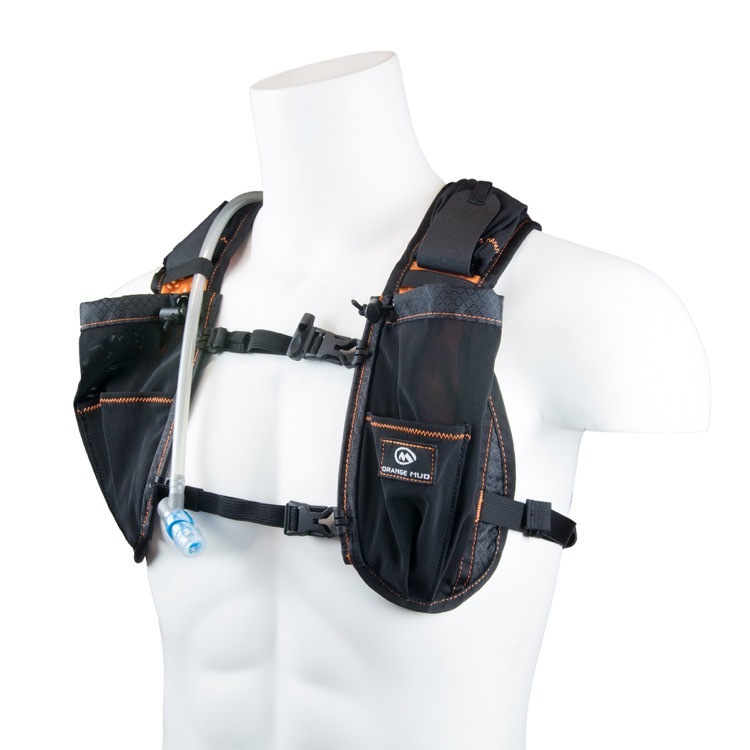 The updated Endurance Pack 2.0 also features a longer chest harness than last year’s model, plus taller chest pockets and adjustable sternum sliders; the front and top of this pack is identical to the Gear Vest. It’s on the back side of the pack where the Endurance Pack distinguishes itself; in addition to the hydration sleeve, there is an additional full-length cargo compartment, and a full-length external pocket that has zipper closure and stretch mesh to stuff larger items. The full 2L reservoir just barely fits vertically into the hydration sleeve, but is held securely in place with a Velcro strap. There is also an external shock cord, and an option to upgrade with trekking pole attachments on the back side if you wish. Both the Gear Vest and Endurance Pack position your fluid and cargo higher on the back than traditional hydration vests; the point of this is to allow improved ventilation lower on your torso, but it’s definitely an acquired feel. 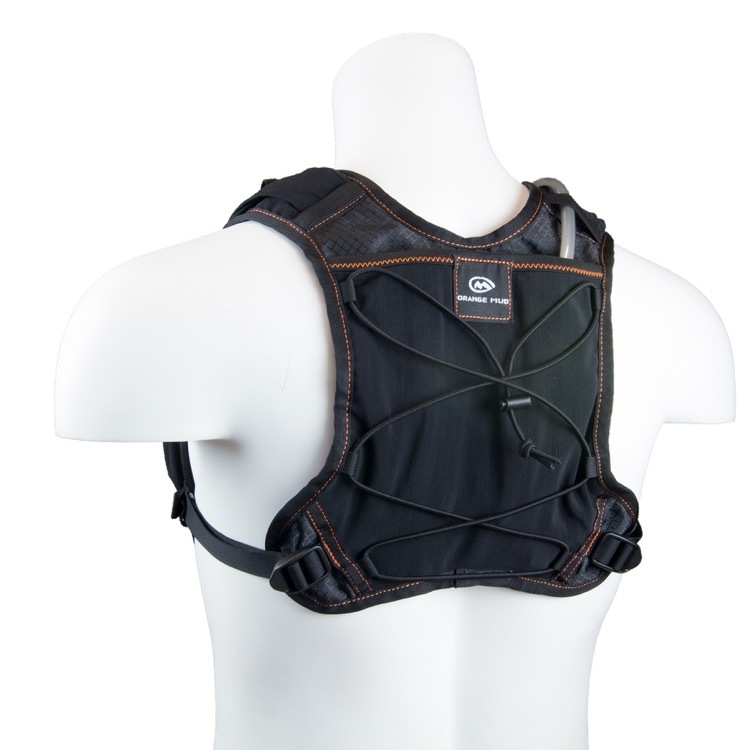 Both products also feature dual elastic sternum straps that secure the front of the vest while allowing for maximal chest expansion when you’re breathing hard. Another hallmark of Orange Mud packs we appreciate is the durability of construction; the fabrics and seams are military-grade and highly resistant to tearing or abrasion. This toughness is combined with a soft mesh interior surface that makes the packs comfortable against your body, but rugged enough to take on whatever crazy challenge you have in mind. 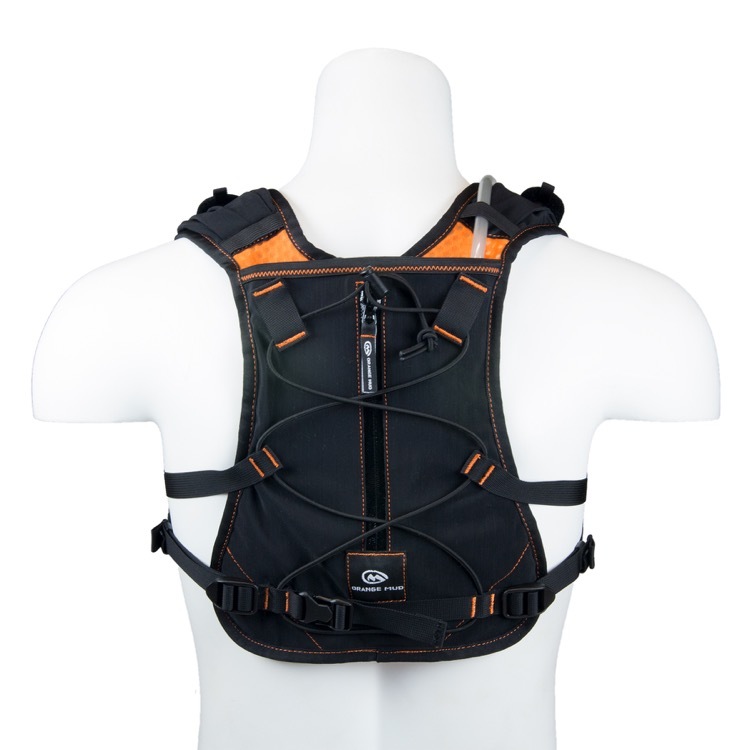 The Orange Mud Endurance Pack 2.0 and Gear Vest 2.0 are now available at www.orangemud.com.